"Mud" tells the story of a man who lives in a boat up on a tree. If that sounds like the beginning of a fairy tale, it's anything but; the movie is very realistic and gritty. 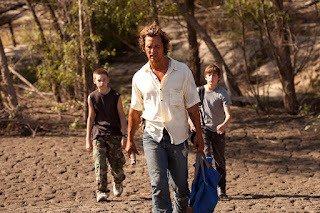 The titular character (played by Matthew McConaughey) is hiding out in an island off a river in Arkansas. He's discovered by two boys, Ellis and Neckbone (Tye Sheridan and Jacob Lofland), who take an interest in his boat before realizing that someone is living in it. The man with the boat introduces himself as Mud. He's quite a sight to see: his hair is wild and stringy, his face is unkempt and unshaven, his teeth are cracked and crooked, and his clothes are ragged. Curiosity gets the best of the boys, and it isn't long before they are regularly visiting Mud – and striking deals with him. Mud explains that he's waiting for the love of his life, Juniper (Reese Witherspoon), who is the prettiest girl he's ever seen. She has nightingales tattooed on her hands, which is how Ellis is eventually able to recognize her. He spots her outside the Piggly Wiggly – which sounds like one of those great movie names for a store, but believe it or not, it's actually real. I began to wonder: What kind of person would refer to himself as Mud? Everyone already in his life calls him that, and he asks anyone new he meets to address him by that name as well. What does that say about him and how he feels about himself and views the world? What did he do to become Mud? As details from Mud's background come to light, Neckbone's uncle (Michael Shannon, in a smaller role after starring in Jeff Nichols' previous film, "Take Shelter") and Ellis's parents (played by Ray McKinnon, also from "Shelter," and Sarah Paulson) and grow more and more concerned. And then there's the old man who lives across from Ellis's family, Tom Blankenship (Sam Shepard). Almost every character, big or small, ends up affecting the plot in some significant way. Like a great novel, there are no wasted moments. The writer and director, Jeff Nichols, has finely crafted a tight, compelling script. The setting of rural Arkansas is a critical component of the film; it completely transports viewers to another world. This is the America that most people don't live in. In order for a movie like this to truly work, it has to be an actors' showcase. Thankfully, the performances are outstanding – particularly by the three leads. Matthew McConaughey has taken interesting chances over the past few years with a string of roles in independent movies like "Bernie" and "Killer Joe." That trend continues here, and it's some of the best work he's ever done. The two children, Tye Sheridan and Jacob Lofland, are just as spectacular. Their performances are completely natural, unforced, and true-to-life. 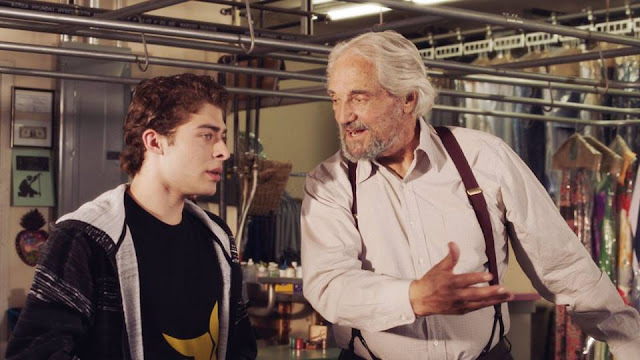 That's all the more amazing when you consider that Sheridan has appeared in only one other film ("The Tree of Life") and Lofland has never been in anything else. 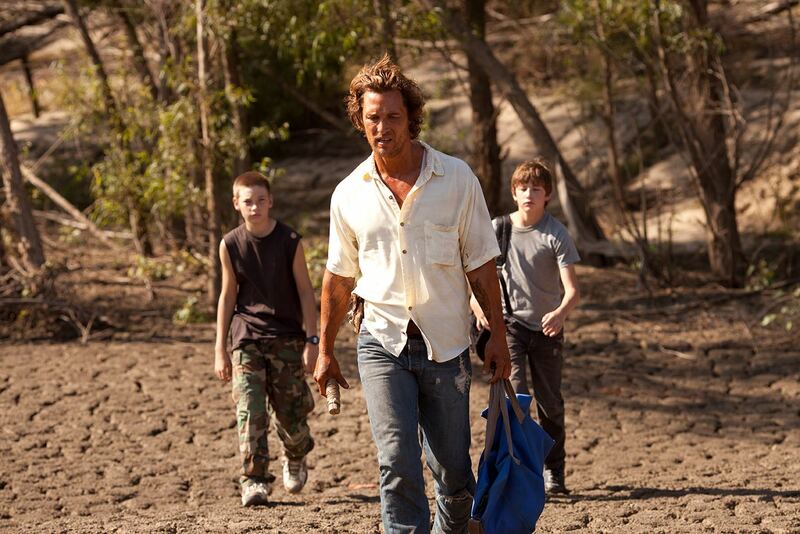 The success of "Mud" really hinges on the kids. It is up to them to carry it, and they do, meshing seamlessly with McConaughey and everyone else they share scenes with. The supporting cast more than carries their weight too. There isn't a bad performance in the bunch – but Sam Shepard's character is especially enjoyable. Without spoiling anything, there's a dramatic sequence near the end, and I could actually feel the rest of the theater getting excited around me. It was exhilarating. The movie is a slow-burner, but it builds and builds with each scene until it pops. "Mud" features multiple mysteries and several love stories. It's a film that will linger in my memory for some time to come.